The pattern I was given is called Leisey Star. 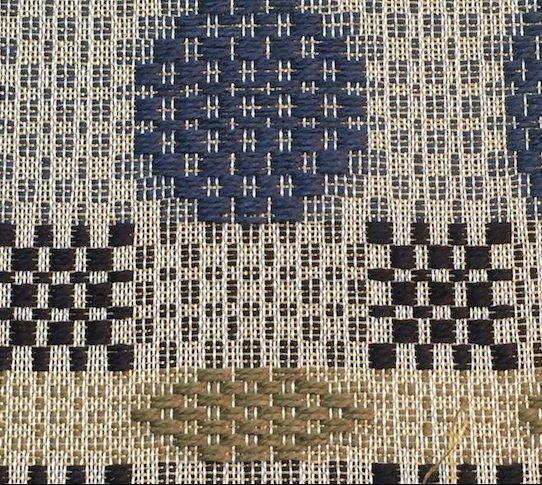 The weave structure is known as “Star Work.” My specific pattern came from the manuscript of Henry Leisey in the collection of the Landis Valley Farm Museum in Lancaster, PA. I was excited to get this pattern because Landis Valley was one of the first places that I bought fiber flax seed from years ago, through their heirloom seed project. 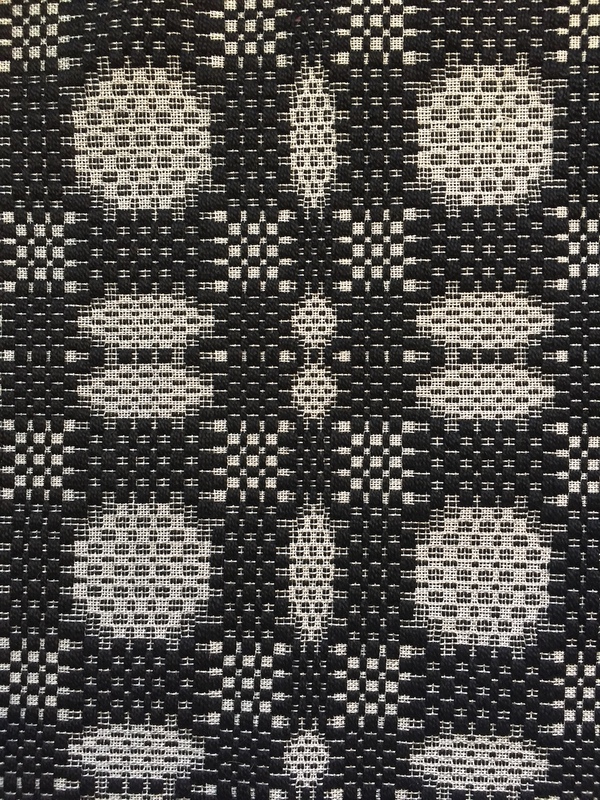 This weave structure involves two shuttles and two sizes of yarn. 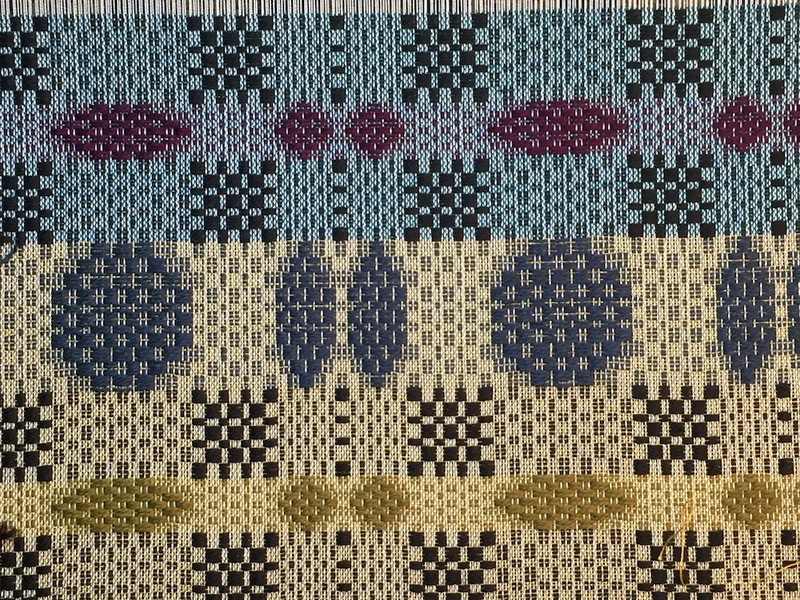 One is a thin yarn that creates the background cloth. 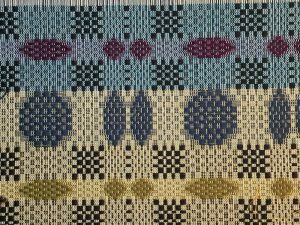 The other is a thick yarn that creates the pattern. 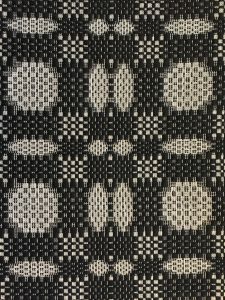 The pattern is created by “floats” of the thick yarn that stay on the surface of the cloth. 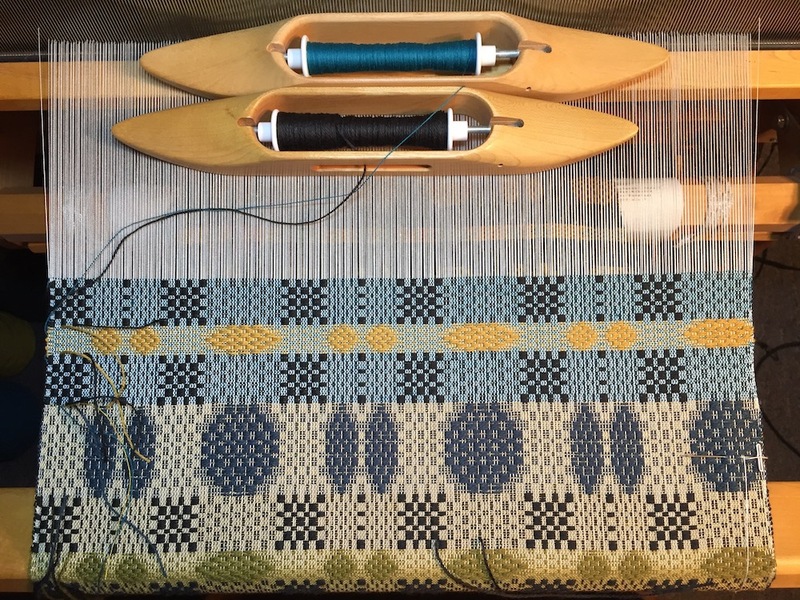 To keep the cloth stable, each “pick” or row of pattern yarn is followed by a row of thin yarn called a “tabby”. The tabby creates a firm cloth that keeps all the floats in place. 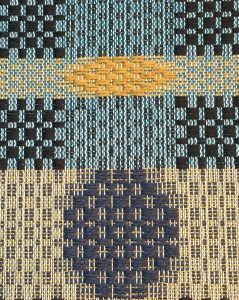 Star Work is similar in many ways to overshot, which is a cloth structure I have woven many yards of, and I’ve posted about before. You can read a couple of my earlier posts here and here. Ideally I would have added another section to repeat the solid, black octagonal shape on the left hand side. The problem wasn’t so much that the design was asymmetrical, though I am a fan of symmetry. It was that handling the two shuttles was really, really annoying. 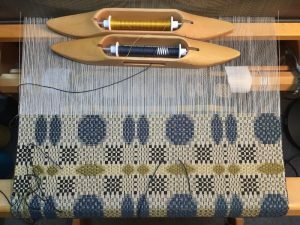 A shuttle is the tool that carries the yarn back and forth in the weft as you weave. 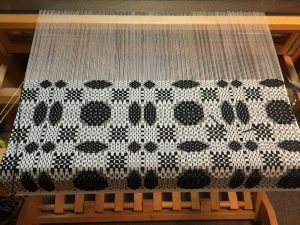 When you are using two shuttles (one for each size of yarn), you usually find a way to bring them around the edge of the cloth in a consistent manner. This keeps the edge looking nice and neat. I couldn’t find a consistent way to handle the shuttles because each edge behaved differently. The selvedges were messy. 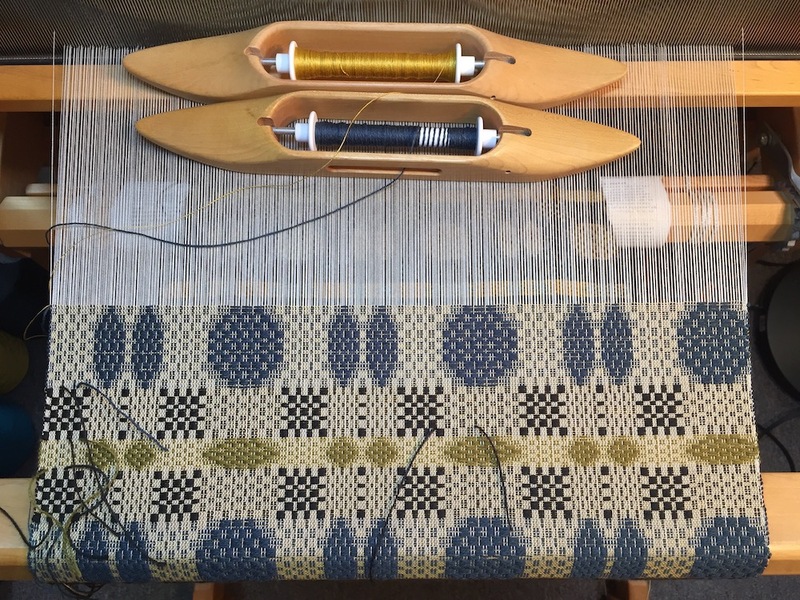 As an experienced weaver, that was hard to tolerate. 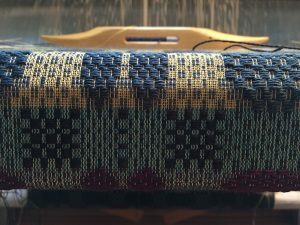 It may sound like a minor thing, but it was really bothering me, and it made the weaving experience unpleasant. This was very disappointing, and the warp sat on my loom for a long time while I struggled with indecision about how to proceed. Should I re-thread the whole thing as Leisey Star, but center the pattern? Re-thread as something else? Just keep going? The yarn in the warp is 20/2 cotton. The ends per inch, or number of threads in an inch, is 30. 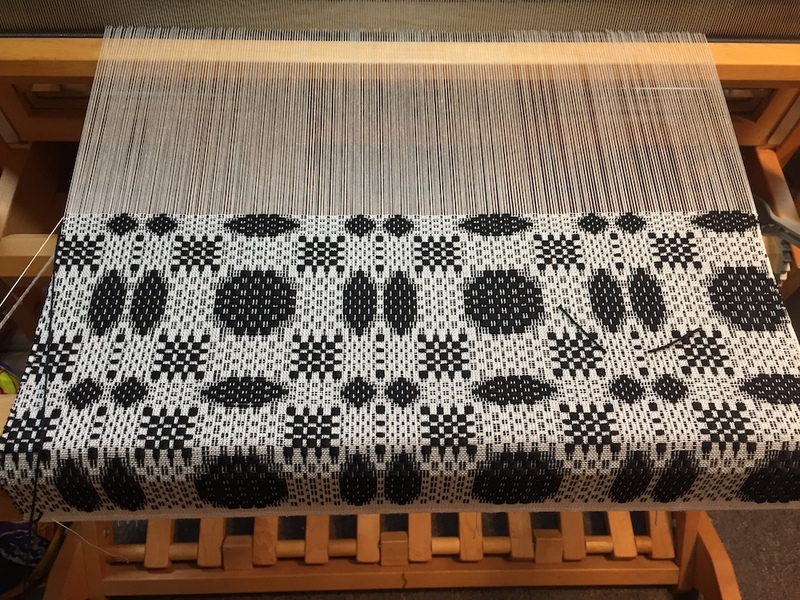 My warp is 480 ends (threads) wide. Re-threading would take a long time…. 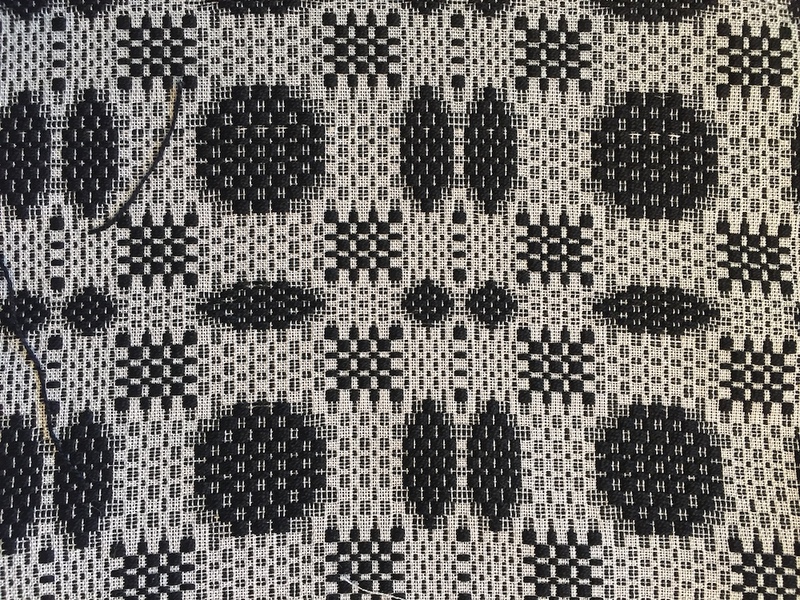 The black yarn is 5/2 cotton. 20/2 and 5/2 are not fractions. That’s the way the size of a yarn is described by weavers. 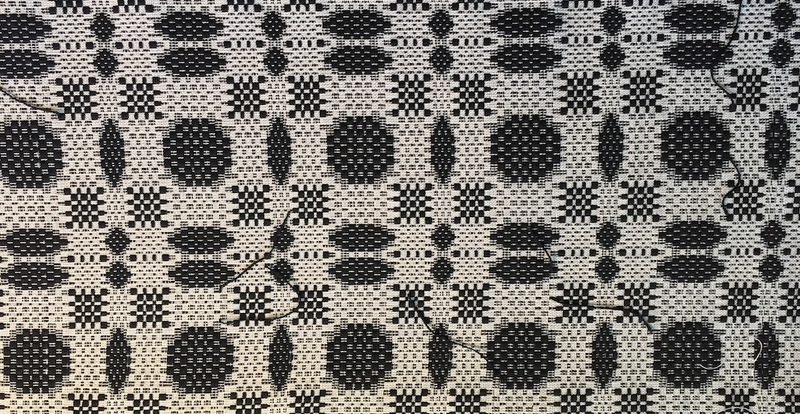 The 2 on the bottom of the number means both yarns were two-ply. 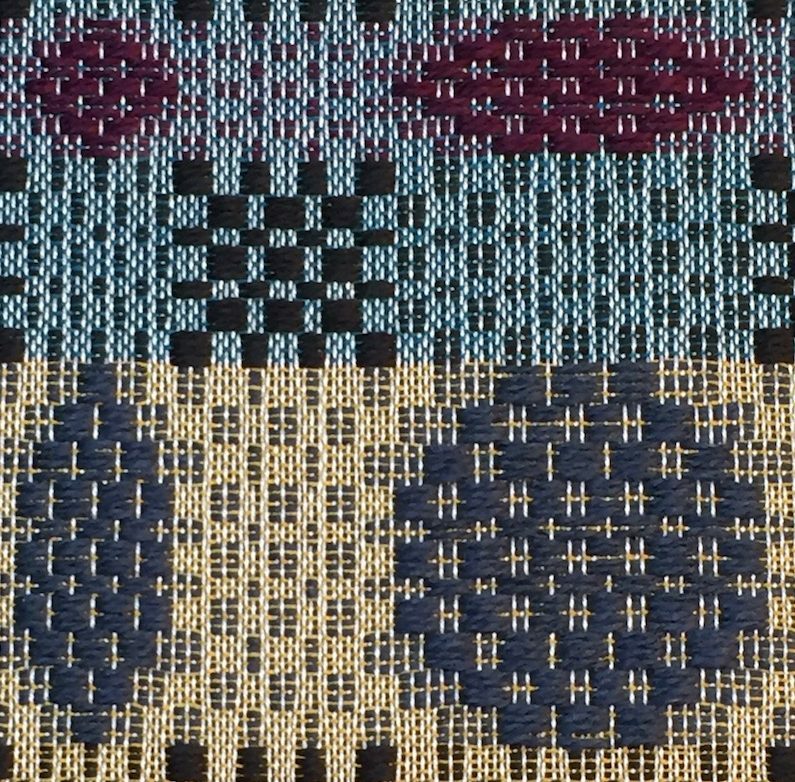 Basically that means my pattern weft was about 4 times the diameter of the warp yarn. 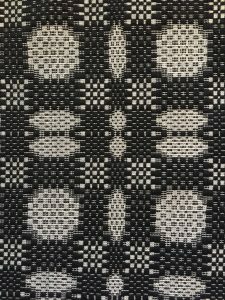 I do not usually weave with such thick yarn, and I only had one color in that size (the black). I didn’t want to buy more 5/2 yarn just for this project. 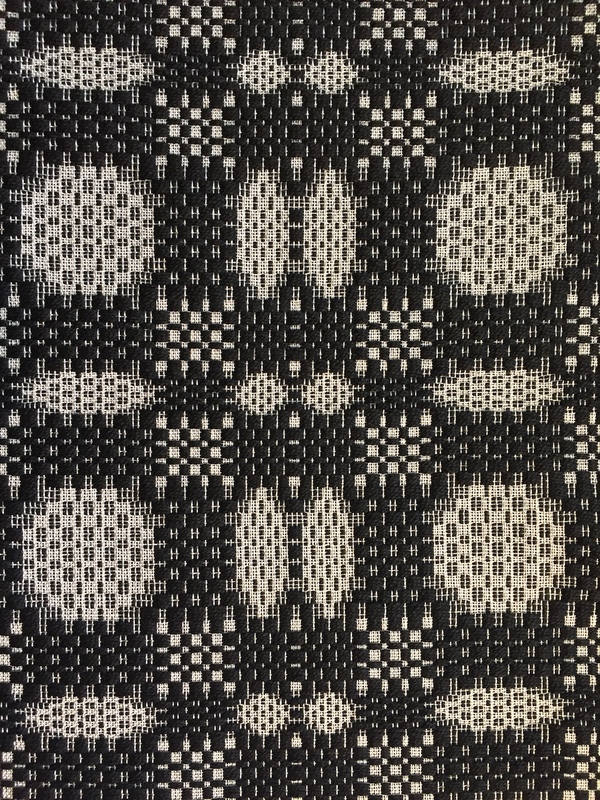 In the end I cut off the section I had woven in black and white, left the threading the same, and added floating selvedges. 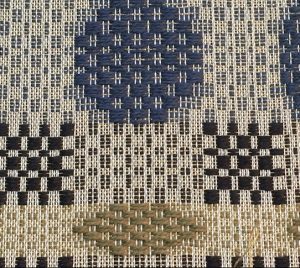 A floating selvedge is an additional thread on each edge that is not part of the pattern. You can go under and over these threads consistently, independently of whatever the other threads in the pattern are doing. To me it is a very useful way of managing selvedges with certain weave structures. 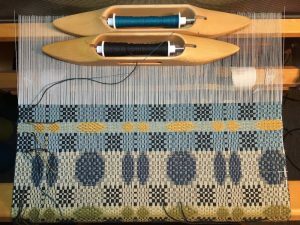 I would have done that at the very beginning, but not everyone likes to use a floating selvedge, and I was originally setting up this project with other weavers in mind. Problem number one solved. Selvedges no longer annoying. Check. 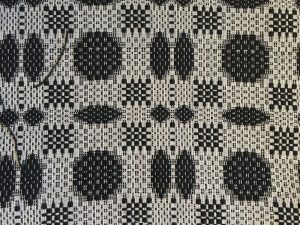 Problem number two was the fact that I didn’t have any other 5/2 yarn, and I wasn’t enamored of the black and white enough to weave 6 yards of it. Instead, I switched to 6/2 yarns. I have a significant stash of this size from many years ago, in several colors. They were mill ends in the back room at Webs, and I was running a weaving summer camp for kids, and it was suitably economical. The cones were like two pounds each, and I seldom use them, so they have lasted me a long time! The 6/2 is a teensy bit thinner than the 5/2, but not so much that it makes a difference to me. I played around with color combinations in both the pattern and the tabby. I have a ridiculous amount of 20/2 yarns in many colors. When I heard that UKI was discontinuing this line a few years ago, I panicked and bought a lot. 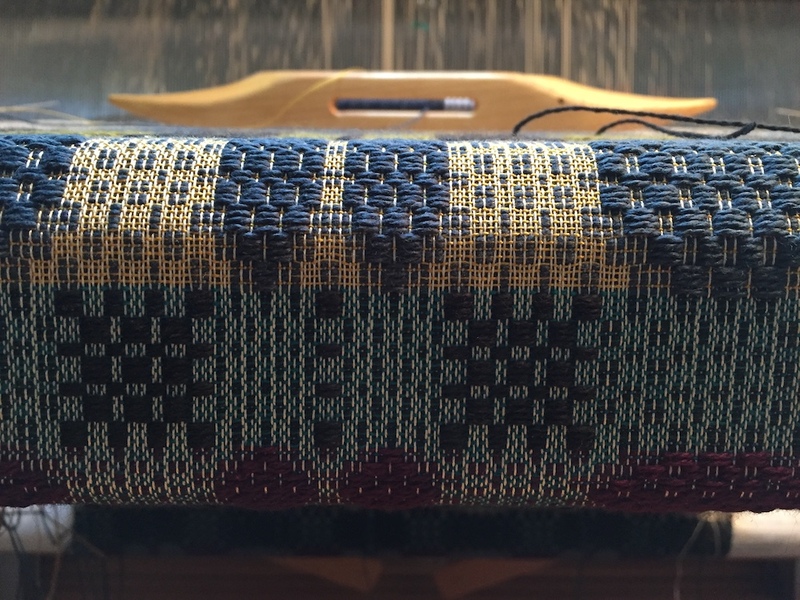 Those were the days when I was weaving book cloth for hand-bound books, and 20/2 makes a very good weight for the warp and tabby when weaving overshot. You can see some photos of the books I used to make in an older blog post here. 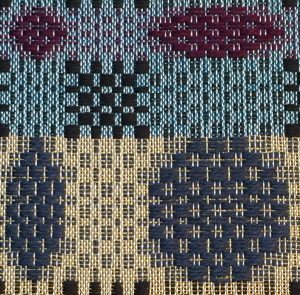 The pattern colors are blue green, olive green, gold, maroon, and black. 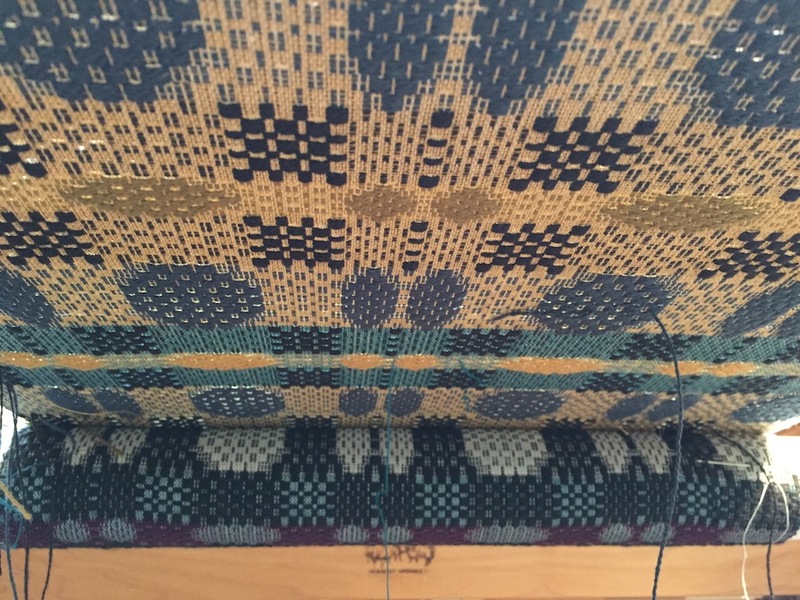 The tabby colors are gold and teal. The teal 20/2 isn’t actually from UKI, it’s another mill end from Webs. 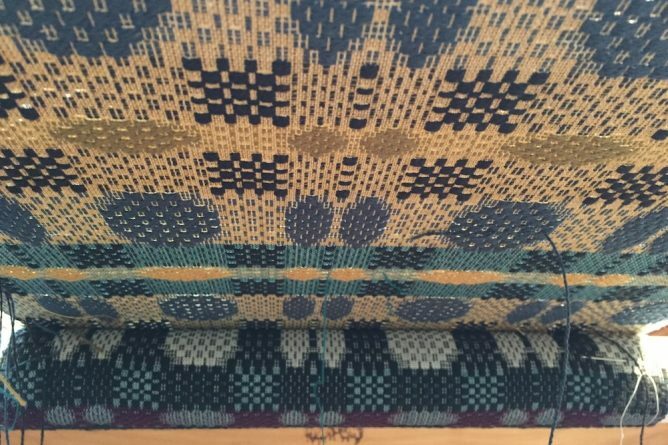 Each section has a different combination of pattern and tabby colors. 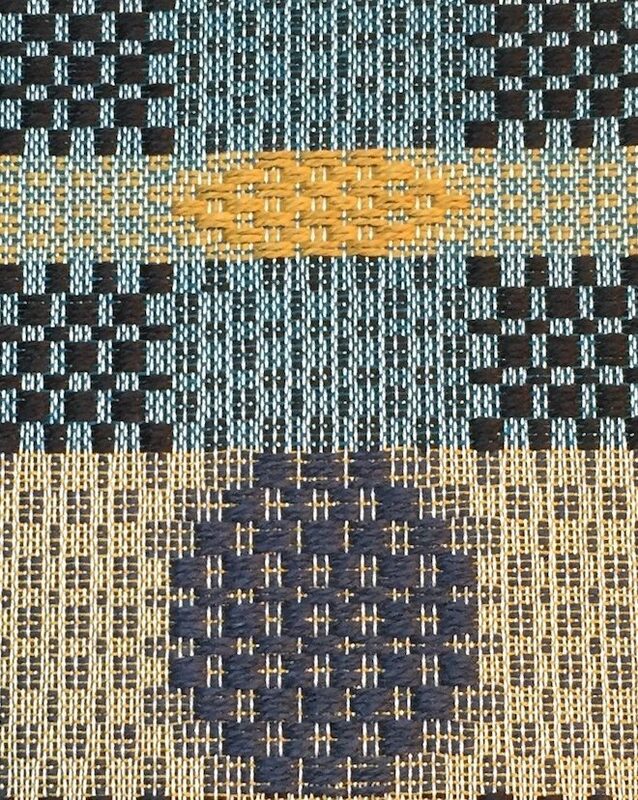 It is fun to weave, and I really like how it’s coming out.